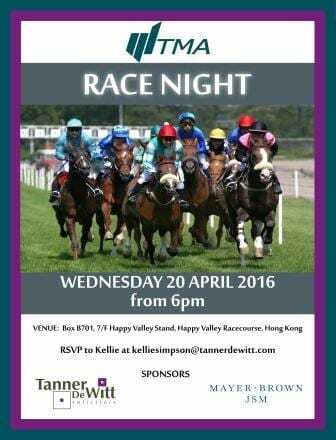 The Hong Kong Chapter of TMA (Turnaround Management Association) will hold a Race Night on Wednesday 20 April at Happy Valley Racecourse. This event is jointly sponsored by Tanner De Witt and Mayer Brown JSM. Find out more here. To book, contact Kellie Simpson on kelliesimpson@tannerdewitt.com or call 2573 5000. Spaces are limited to current members who have renewed for 2016 membership. To renew your membership, please contact Lizzie Fraser at lizziefraser@tannerdewitt.com. Find out more here.